Ontario is on track to eliminate the $11.7-billion deficit in the next four years without worrying about cutting programs, Finance Minister Charles Sousa said today. The Liberal government is prioritizing investments in jobs before meeting "short term targets" to balance the province's books. "Stronger economic growth and new jobs are the surest, fairest path to higher revenues and a balanced budget," said Sousa in this year's fall economic statement. “Let’s be clear. We’re on target to balance the budget by 2017-18 without taking measures of austerity and Ontario’s now become the lowest cost government anywhere in Canada," Sousa said in an interview with CBC's Lang & O'Leary Exchange. For the last four years, Ontario has controlled spending to under one per cent growth, but there is now a need to invest, he said. "We must invest in our future. It’s about investing in people, investing in modern infrastructure and supporting a dynamic and innovative business climate so that we can create jobs," he added. Sousa said that the uncertain and slow recovery from the global recession has led to $5 billion less in projected provincial revenues since 2010. The province has revised its estimates of economic growth downward because of the U.S. government shutdown and more modest exports from Ontario. Souza now assumes real GDP growth will be 1.3 per cent in 2013 and 2.1 per cent in 2014. He said the gloomier economic picture did not affect the deficit forecast. "We can’t cut our way to success, we can’t tax our way to success, we must find a balanced program," Sousa said. Earlier Thursday at a Toronto conference on public-private jobs in Toronto, Premier Kathleen Wynne said the Liberals were not relenting on their goal to cut the deficit. "It's not that we are saying we're abandoning that and we're going to now just spend and invest," she said. "We're the leanest government in the country. We need to continue to make sure that we control spending in a rational way, but I am determined that we are not going to cut and slash the services that people need." The statement showed a heavy investment in infrastructure projects, the centre of what Wynne calls the party's economic growth plan. Eleven major projects are getting the green light, including the extension of Highway 427 in York Region and major improvements at GO Transit. 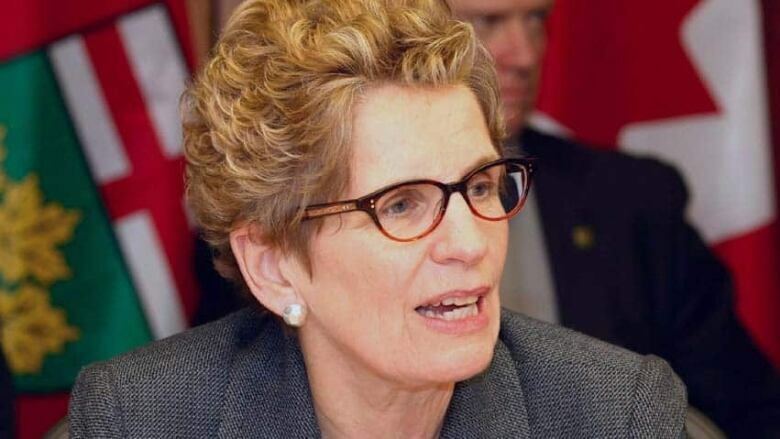 The premier also warned that there's no money for pay raises for nurses, civil servants or teachers, and that the province must keep a tight lid on public sector salaries. "We're going to need to work with our partners in the public sector to make sure that they understand that there isn't a lot of money for increases," said Wynne. "A large percentage of the provincial budget is salaries for employees, so we have to continue to constrain those costs." Sousa also said the province will lower the $35 Drive Clean fee for vehicle emissions, though it hasn't yet been decided by how much. Ontario will also change the way dividend tax credits are calculated to save about one million shareholders an average of $145 a year. Investors who don't pay Ontario's income surtax with benefit from the change — which kicks in at $70,000 income. The province is also mulling changes to payroll taxes, including a reduction of the health tax. Sousa said he is concerned about the productivity gap in Ontario and wants to stimulate the private sector. "We need to find incentives for those companies that are sitting with lots of cash on their books – this notion of having dead capital or lazy capital. We need to find ways to invest that cash in ways that will mean more returns for those companies and jobs for Ontario," he told CBC News. Once again, Sousa called on the federal government to increase Canada's Pension Plan benefits, warning that Ontario will create a plan if Ottawa fails to do so. "So far the federal government is resisting calls to make those enhancements," he said. "We all pay a heavy price for that inaction. If an agreement cannot be reached, we will move forward with a 'made in Ontario' solution."